Caju Afrique has the nearest lodges and camp sites to Panda, home of the Olive-headed Weaver. We are situated on the Rio Inharrime and have beautiful walks for birders. If you are en route to or from Panda or just travelling past, stopover at Caju Afrique and experience the tranquillity and birdlife of our resort. Our accommodation includes three furnished, fully equipped self-catering facilities, and two campsites. For details see www.cajuafrique.com, e-mail enquiries@cajuafrique.com, or phone +27 837 844393 to book. 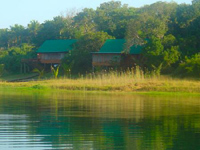 CASA MSIKA hotel and campground is located on a beautiful 745 hectare forest reserve on Lake Chicamba. It is located just 44 kilometers from Zimbabwe-Mozambique (Mutare/Machipanda) border on the "Beira Corridor" main highway. Accommodation in the form of 2 bedroom family sized chalets, 1 bedroom chalets and a dormitory chalet. All chalets have en-suite toilet and shower. Backpacker and caravan sites also available. The hotel has an excellent bar and restaurant and swimming pool. Activities include hiking trails, fishing, birding & lake-water sports. Tel: 258 51 22675 or Fax: 258 51 22701.